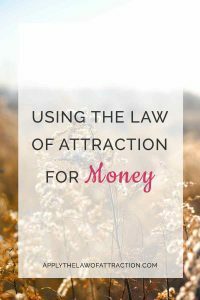 The Law of Attraction for Money uses a similar process as you use when applying the Law of Attraction to all areas of your life. But you have to understand that your thoughts have a huge impact on your success. Where you are in your life financially right now is a result of all the thoughts you have had about money in your life. Where you will be in 1 month…1 year…3 years…will be a result of the thoughts you have about money until that time. So you must choose your thoughts about money carefully if you want to use the Law of Attraction to create wealth. You must focus your thoughts on wealth. If you think about not having enough money, how expensive things are, or how you spend your paycheck as quickly as your receive it, it is impossible to attract money. If you focus on the lack of money, you will attract circumstances where you don’t have enough money. You have to focus on how abundant money is. Pretend that you have more than enough money. When you go shopping, look at the things that you want and tell yourself that you can afford them. Keep a large bill in your wallet… $20… $50… $100… and whenever you go out, spend it with your imagination. Notice all the things you can buy with that bill. You will instantly feel better about money, and as you feel better, you will attract more money to you. The only reason you don’t have all the money you want now is because of your thoughts. You attract to you whatever you give your attention and focus to, whether positive or negative. It can be hard to grasp that you are responsible for the flow of money coming to you…that you have been blocking money from coming to you…simply with your thoughts. But the Law of Attraction responds to your thoughts whether they are good or bad…whether they are things you want or don’t want. Change your thoughts about money and more money will come to you. If you need money, you will attract situations where you need money. If you are afraid of money, you will repel money…it will pass through your fingertips…always just out of reach. If you love money, you will attract situations where money comes to you. To manifest money, feel the way you would feel if you were wealthy. Be happy and joyful. An abundance of money will start to come to you. It doesn’t have to come through your job. It isn’t up to you to decide how the money will come to you. All you have to do is focus positively on money.